The company Megahouse revealed a new line some time ago called Desktop Army. It is a line of small figures with the exact same play-pattern as Busou Shinki: small robot girls, with modular armor and weapons. The difference is, Desktop Army are trading figures: they're sold by the case on places like Amiami, with weapons and armor unassembled and unpainted, model kit style. The first wave, Sylphy-series, was designed by Blade (yes, that Blade). The second wave, Chrom-series, was designed by Tanimeso (yes, that Tanimeso). Favorite MMS/Shinki: You mean owned or..? 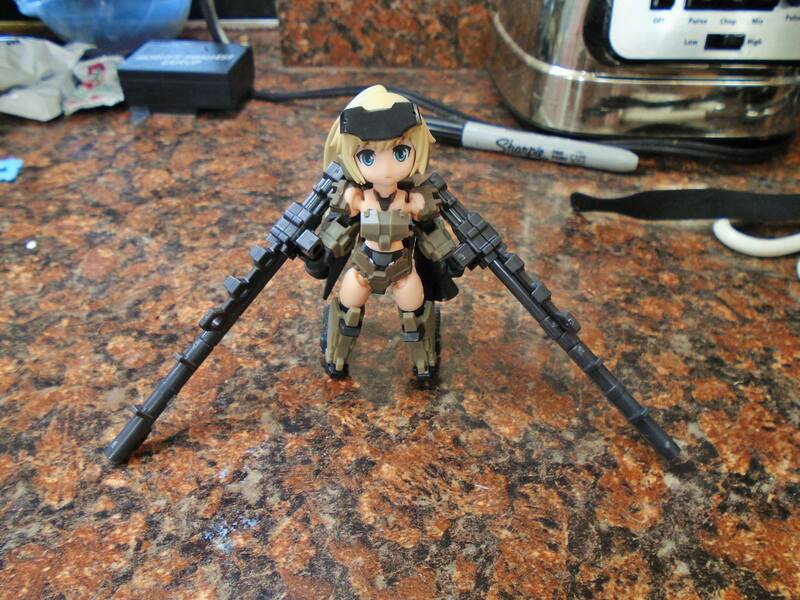 Guys, I think I'm hooked on a new mecha musume line. This figure is so goddamn cute. I'm gonna see if I can track down the other two Gourai variants. And the Slyphy variants. And the three Fate/Grand Order tie-in figures. And the rest of the line if possible. I have one of the innocentia D.A. She's pretty cool for the size but re-bodying her soon. the armor/parts kit is pretty cute but not sure what to do with these leftover pieces.